Pro Motion Clinic's blog shares the latest insights into health, nutrition and movement and highlights the incredible athletes in our local Kelowna community. Thank you for subscribing to our blog! We hope you love it as much as we do. We’ll now have RMT treatments available on Saturdays (along with early morning and evening appointments) to better accommodate your schedule! Born and raised in the Okanagan, Rio left to pursue her love of massage therapy in Vancouver, B.C. While in Vancouver, Rio worked with a wide range of patients from different organizations including UBC Varsity Athletics, BC Women's and Children’s (pre/postnatal and labour), Canuck Place, GF Strong Hospital, the MS Society and lululemon Seawheeze. These experiences solidified Rio’s passion for both sports rehabilitation and pre/postnatal massage. Rio’s passion for sports and rehabilitation has its origins in her own 16 year history of competitive figure skating and dance, as well as in her active lifestyle. At the same time, the past six years spent nursing at Kelowna General Hospital as both a surgical and medical nurse have enhanced her knowledge of post-surgical recovery. Rio brings this knowledge to all of her RMT patients, providing them with a thorough treatment plan to better assist their recovery. She is looking forward to bringing her unique qualifications to the Pro Motion Team and is even more excited about working with her patients, enhancing their ability to enjoy their lifestyle in optimal health. Pro Motion is a modern, innovative clinic located in Kelowna, B.C. Our team provides chiropractic, massage therapy, acupuncture, kinesiology and nutrition support. We are passionate about enhancing movement and engaging experiences. Simply put, we know how to bring out the best in you. We're stoked to share our incredibly inspiring athlete of the month, Troy Boot! Have you always lived an active lifestyle? What’s your story? Yes. I started racing dirt bikes in 1978. In 1984, I started working out to get stronger to race dirt bikes. By 1988 I had bought into a gym. I trained with a bodybuilding focus. I did my first and only bodybuilding show in 1988. In 1992, I sold the gym. I remained active and my interests switched to the outdoors. I became a hunting guide in the mountains. I also worked in the oil patch for 15 years. During this time I became less active, overweight and out of shape. In August 2009 I was introduced to crossFit by Brad Hall. This day changed my life forever. 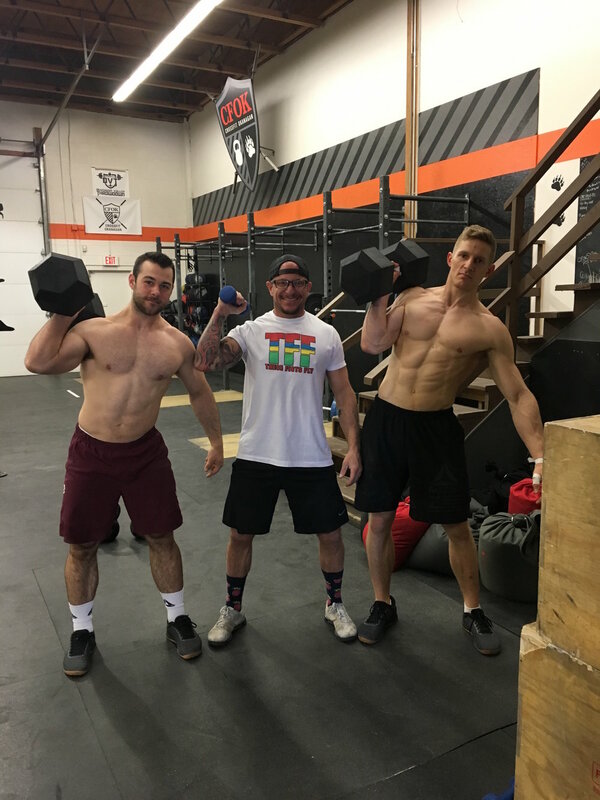 I have been doing crossFit ever since, for almost 9 years. I love what I do because of the change it created for me. I want that change for other people. I want people to really live the best life that they can and to believe in themselves, to believe they can do it. Even though it can be a hard road, I know it’s possible because was “that” guy. I had high blood pressure, high triglycerides, was overweight, smoked cigarettes, chewed Copenhagen and drank Gibson’s finest. Now that’s an athlete! These days I drink protein drinks, BCAA’s, count my macros, focus on sleep and recovery and train 5-6 days/week. What inspires you when you’re coaching an athlete? Helping each athlete achieve their goals, whatever their goals are. Each athlete has different goals and a different mindset; I want to help them achieve that goal. What’s the hardest obstacle you’ve had to overcome in getting ready for the CrossFit games? The hardest obstacle is self doubt. I have to remind myself every single day that I do have what it takes. Also, pushing In my training even when I want to quit. What advice would you give to an aspiring CrossFit athlete? Set goals for yourself. Start with short term realistic goals as well as longer term goals to train for. For example: a competition, the Crossfit open next year, a race, etc. Every day do one thing that gets you closer to your goal. Believe in yourself. Ask for help. What is your proudest CrossFit accomplishment? In 2014 I gave up my Masters 1st place position to compete in the Men’s finals and placed 2nd overall in the Men’s category. I'm also proud of qualifying for Wodapalooza in Miami and competing against Games athletes in Miami at Wodapalooza. This year placing Top 30 in the world in my age group felt like a huge accomplishment. What do you do to keep your body healthy during training? 1) As I get older I realize I need to listen to my body more than ever to prevent injury. 2) Epsom salt bath everyday. 4) I've gotten acupuncture and cupping treatments with Nicole Albertson for the past five years at Active Living. 5) I visit Lars for treatment 1-2x/week. What’s your favourite thing to do in Kelowna when you’re not at the gym? I love to sit in the shade at the beach and hike with my little buddy Murph. What’s your favourite cheat meal? I eat the same way every day (for the most part). When I go out, I love a good burger and fries. I also love candy: licorice, big Turks, M&M’s - you name it! Is there anything else you want to share or get out to the community? I would say this to the people who are on the fence about starting CrossFit: Just do it! Walk through the doors. It’s like magic. Your life will change. Be part of the community. Do your best every day.